Tennis Player with Knee Pain Treated with Platelet Rich Plasma. When a Tennis Player gets knee pain it can be a real problem, especially when in competition. Just ask the World Number 1 Tennis player Rafael Nadal. 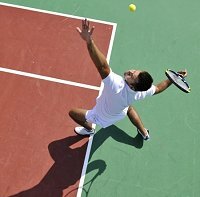 A competition Tennis player began having nagging knee pain that was hampering his ability to perform, enough so he was losing matches because of it. He consulted with Dennis M. Lox, MD, and it was agreed that Platelet Rich Plasma (PRP) was a good option. He had several tournaments looming around the corner and losses would affect his ranking. The PRP injection into his affected knee was performed. 2 weeks later he was greatly improved and resumed his Tennis play. Platelet Rich Plasma (PRP) is a Regenerative Medicine technique in which the patient’s own blood is concentrated and the platelets are separated. The platelets release growth factors which can aid in the healing process. Many elite professional athletes from Tiger Woods, Kobe Bryant and Tennis World Number 1 Rafael Nadal have utilized. Dennis M. Lox, MD, is a Regenerative Medicine specialist who focuses on the way new therapies can be utilized to more effectively treat Knee disorders that were previously thought to be untreatable. The field of Regenerative Medicine provides cutting-edge treatment options for problems that were offered little hope in the past.